Horses and carriages evoke an image of yesteryear that most people enjoy. If you run a carriage business where you provide people with horse-drawn carriage rides, you should definitely have carriage ride insurance. While the typical carriage ride is fun and relaxing, unfortunately something things happen that we cannot anticipate. Even the most docile horses can become startled by all types of distractions wherein accidents can occur that could result in injuries to your passengers and/or injuries to people in the nearby vicinity. 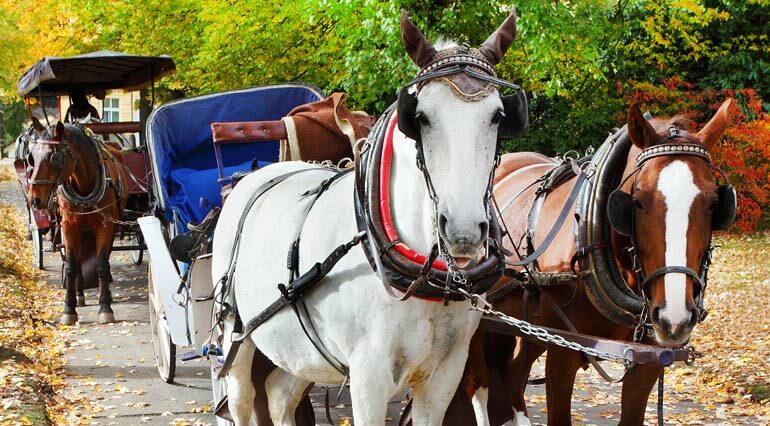 Whether you provide wagon rides for children’s birthday parties or romantic carriage rides to newlywed couples, it’s imperative that you have insurance for your horse drawn vehicle. Since carriage rides typically involve multiple passengers and often bystanders in the cases of festivals, fairs and parades, there are liability risks all around. It’s a widely known fact that horses can act in an unpredictable manner at times and more so when they’re in busy areas. This means you should also be aware of the fact that property damages can occur if some type of accident were to take place. Passengers becoming injured when getting into or out of a horse drawn carriage or wagon. Passengers becoming injured by falling out of or jumping from carriages. This even includes the damage or loss of personal items during this type of accident. The horse becoming spooked wherein it runs away frightened, doing damage to vehicles, buildings, lawns or other types of property. A bystander comes too close to a horse wherein he/she is bitten, kicked or stepped on. While on a roadway, the carriage comes too close to a vehicle to cause damage to that vehicle. People tend to be fascinated with horse drawn carriages and wagons. While you are enjoying providing horse drawn carriage or wagon rides, the team here at Ark Agency wants to be sure you are covered by insurance so you can continue doing what you love. If you are sued because of an incident involving your horse and/or carriage, court costs and attorney fees can quickly skyrocket out of control, adding up to tens of thousands of dollars. This high expense is nothing you want to come out of your own pocket, so it’s important to have insurance coverage to protect yourself. Carriage insurance will also cover claim/settlement costs wherein it will pay for bodily injury and property damage claims for which you are held responsible. Few insurance companies provide special risks liability insurance on a package policy for higher risk activities such as horse drawn vehicle rides. However, Ark Agency can usually coordinate your policies and place your property coverage through one insurer and liability coverage through another. Or, we can provide you with commercial liability insurance wherein you can obtain the property coverage you need elsewhere. We’ve been providing high quality insurance and risk reduction services in all 50 states for longer than three decades. Give us a call today so we can help you choose the right type of insurance that will provide you with the protection you need for your peace of mind.